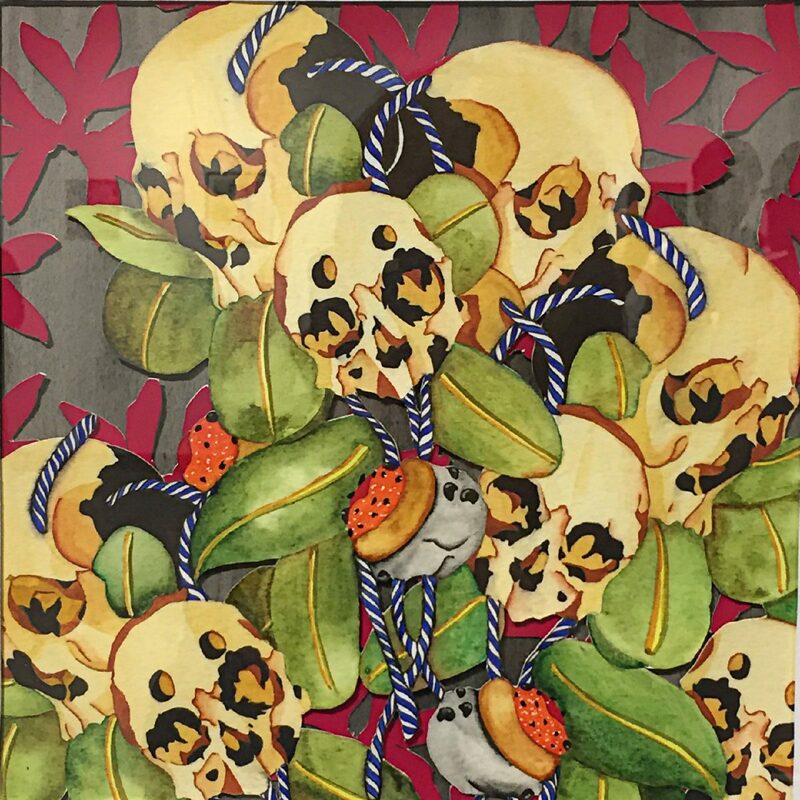 The Art Department at South Texas College hosted an interesting art exhibition in October. Unfortunately, it was part of the Texas Association of Schools of Art conference and wasn’t publicized for viewing. Artist and gallery owner Mark Clark of Brownsville’s Galeria 409 and Mi Vida Loca in Corpus Christi judged the show, and awards were presented by South Texas College’s Rachael Brown, who was also the conference coordinator. 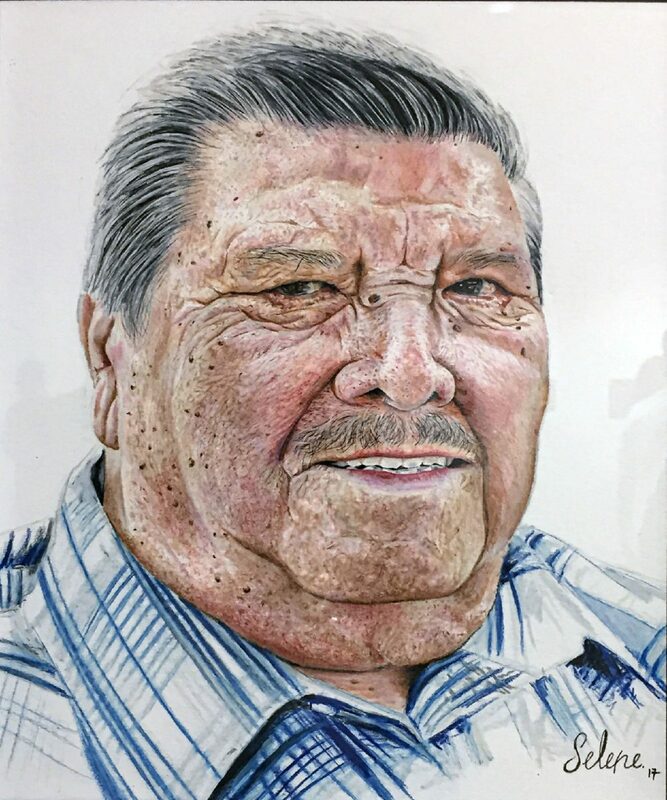 Selene Elizondo won first place for her realistic prismacolor drawing, “Portrait of My Grandfather.” Second place went to “Favorite Drink” by Clearance Talley Sr., whose mixed media work constructed of strands of Mardi Gras beads gave a festive setting to the beverage. Curiously, neither the first- nor second-place works were 1-square foot. 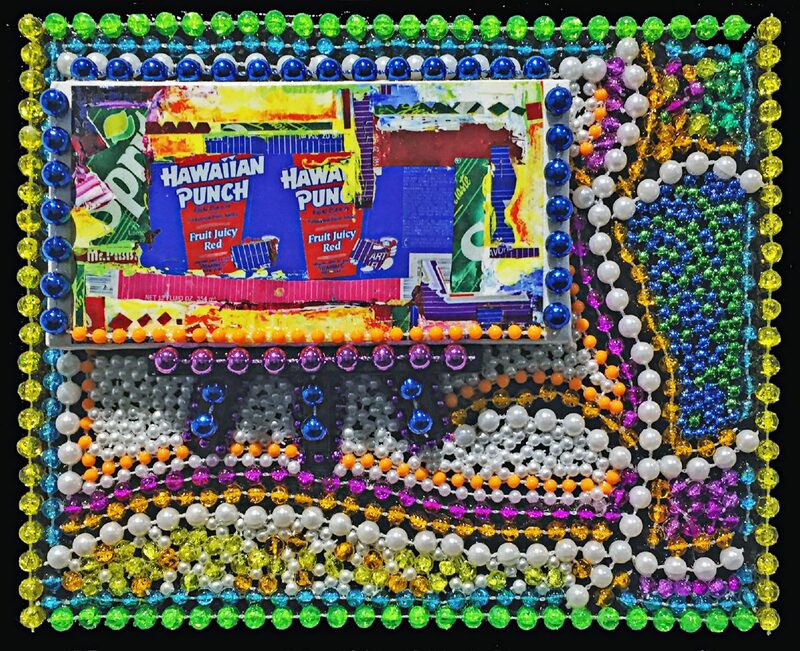 "Favorite Drink" by Clearance Talley Sr.
“Montezuma’s Silver Teeth” by Rolando Reyna took third place. Inspired by a work — the Aztec mosaic mask — that has endured for centuries, Rolando Reyna ironically eschewed the idea of archival relevance with “Montezuma’s Silver Teeth,”an exquisite ink drawing on a servilleta. “A couple of years ago,” he said, “I was going into this little coffee shop before I went to work, and I started working on napkins. 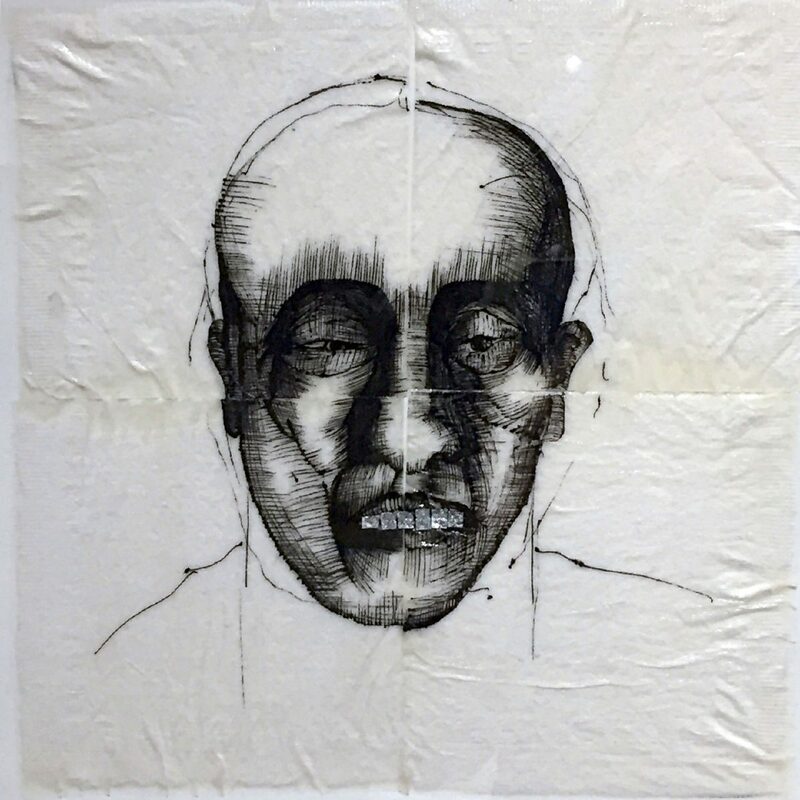 I made several drawings using those little square napkins.” Wanting the teeth to reflect their importance as in the original, he added silver foil. “1 Foot of Art” was interesting as a statewide academic survey of artistic taste. Participation in the show was restricted to the organization’s membership. The exhibit gave a hint at what’s on aesthetic minds elsewhere in the state. Labels did not give institutional identification, and styles leaned predominantly toward the conservative, with the exception of artists from the University of Texas Rio Grande Valley and STC. Well, this pleased and surprised me. 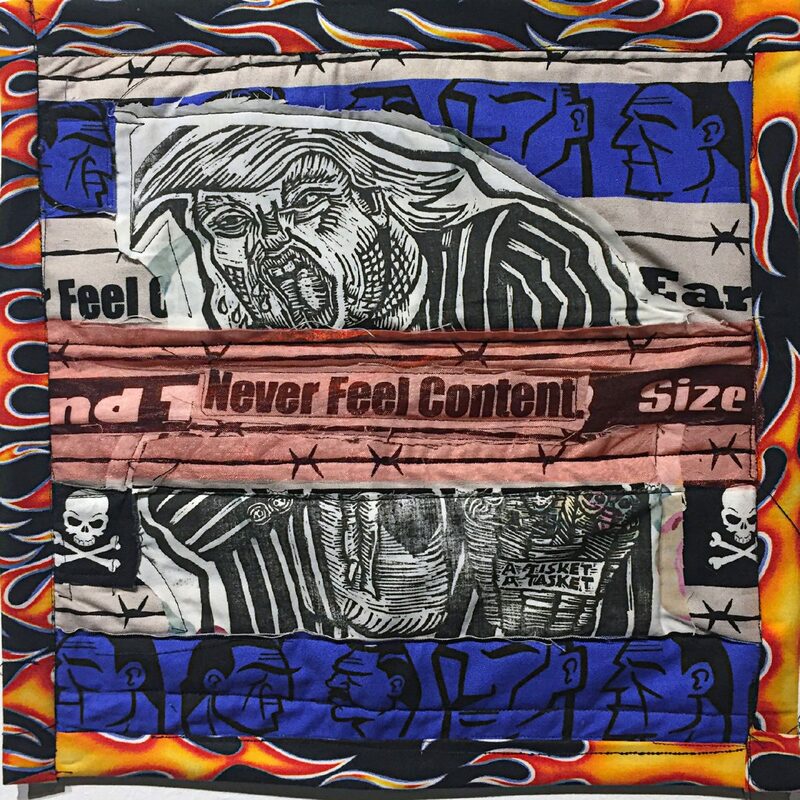 Donna Sweigart and Celeste de Luna expressed social commentary; Sweigart’s work was also the most technologically forward piece in the show, and De Luna was intensely passionate with a no-holds-barred political view. Elsewhere, surface differences were subtle, but carried deeper meanings. 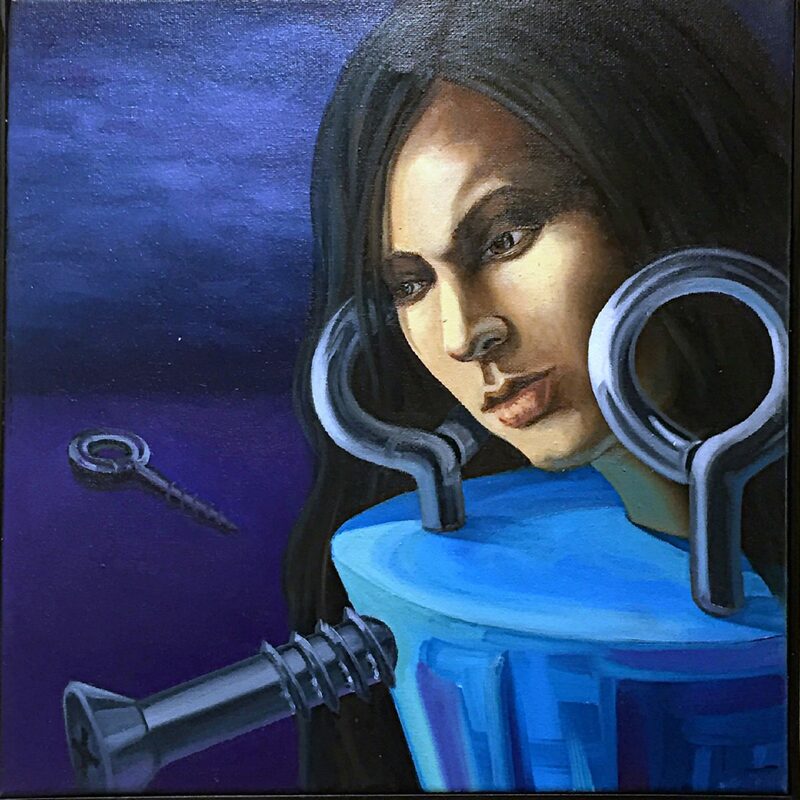 Some works suggested personal problems in today’s world, such as “Predicaments” by Eva Solis, and the engaging watercolor, “To the Newlyweds” by Jesmil Maldonado Rodriguez. Although this watercolor may just be a friendly gesture to friends who like Dia de los Muertos symbolism, through its title it carries an ominous message. But none were more unsettling than De Luna’s “Trump Eating his Children,” a woodcut on fabric, which referenced the notion of malevolence and conflict in power from Greek mythology via Francisco Goya. Happier outlooks were offered by Phyllis Leverich and Rachel Brown. Brown remembers her grandfather reading this story to her. 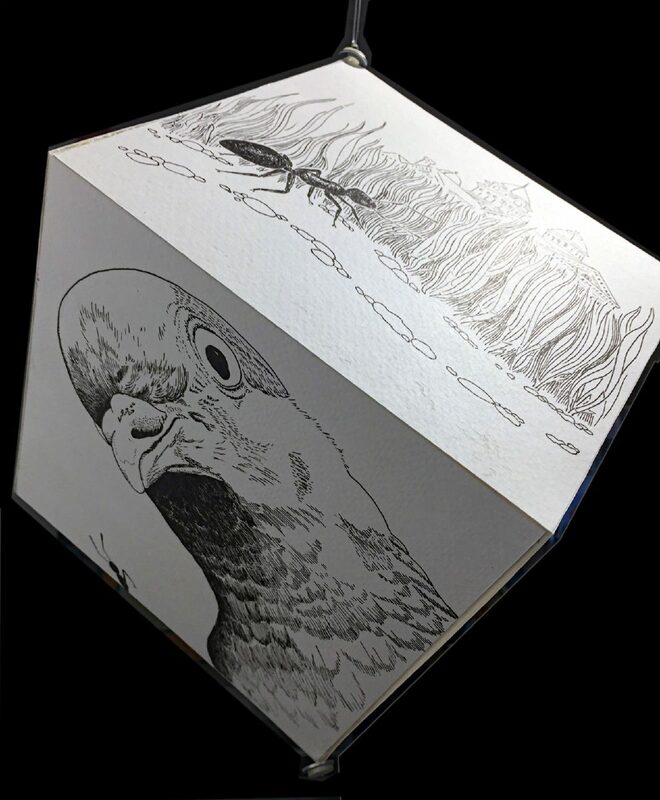 “Sam the Ant and Mr. Pigeon” illustrates the charming story in ink on a 1-foot cube. 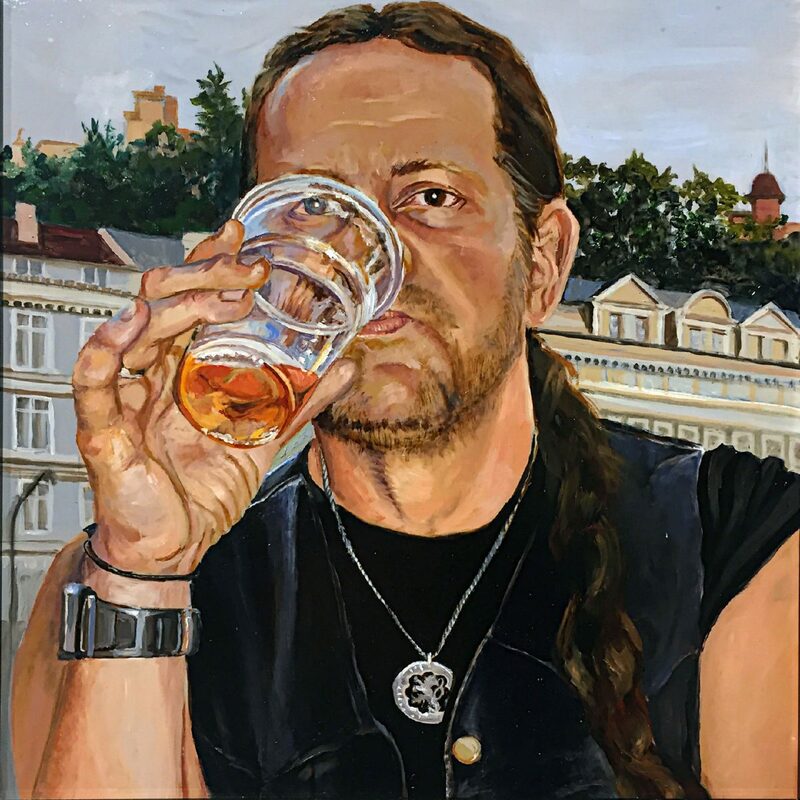 Carol Fairlie’s painting of her husband, “Through the Drinking Glass,” could be read either way. Realistic imagery was pervasive in this show. The majority of the works were wall pieces, but some free-standing sculptures and ceramics sat on low pedestals, and although beautifully executed, were of lesser interest. 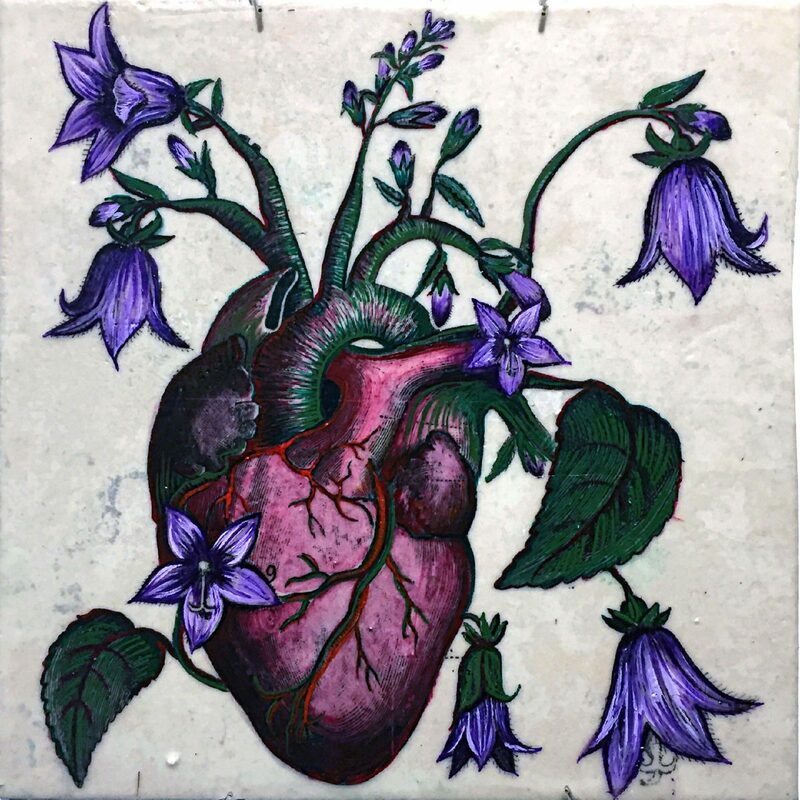 Nancy Moyer, professor emerita at UTRGV, is an art critic for The Monitor. She may be reached at nmoyer@rg.rr.com.